Going Commando | A SWTOR Fan Blog: Do We Need a Coffee Bucket List? Do We Need a Coffee Bucket List? Back before WoW came out with its Cataclysm expansion, I felt some pressure to complete certain bits of content before the big revamp of the old world was going to cause them to disappear (seemingly) forever. I even got the Loremaster achievement, which involved the completion of a total of over three thousand quests! Okay, so I had already done a large chunk of those beforehand, but it was still a fair bit of work. In The Old Republic, I've never engaged in any kind of major pre-expansion preparation so far. I only remember that before Rise of the Hutt Cartel came out, I was kind of hoping to clear EC NiM while it was still current content. That didn't happen in the end, but it was no big deal. I simply went back later. However, with all the changes that Knights of the Fallen Empire is supposed to bring, I've been thinking about compiling a sort of bucket list. First off, there is the matter of operations getting scaled up. Trying to "finish off" Ravagers and Temple of Sacrifice is actually incredibly pointless right now, because with the new level scaling they'll still be current content after KotFE comes out. Instead it's the old operations that we should be worried about, if anything. 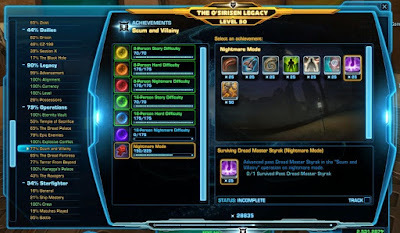 The old level 55 nightmare modes are still challenging in terms of mechanics - it's only at level sixty that my guild got a lot of them down, and even so we are still missing a lot of achievements. Since we didn't manage to get them while these were current content, the next couple of months until the expansion are pretty much our last chance to snag them while we are still sufficiently overpowered! After that it will all be scaled up to be current content again, and things like the Dread Council on nightmare will probably be too hard for us again. That's kind of... bizarre. Unless I'm planning to get a whole lot better at the game, time to complete those ops achievements is running out. However, even if we assume a fairly strict definition of what's a story quest, the question still remains of how to deal with the threat of all those loose ends simply being cut off. I confessed not that long ago that only two of my characters have actually completed Ziost, and the more I look around my stable of alts, the more gaps become apparent. Not all of them have completed Yavin (mostly because I chose the operations ending on some and then never got around to taking them there). A few haven't even completed Rishi! And let's not even talk about my level 56 Shadow who has yet to wrap up her last class mission on Corellia... I also can't help but think of a guildie of mine who plays a Shadow tank in our operations sometimes. 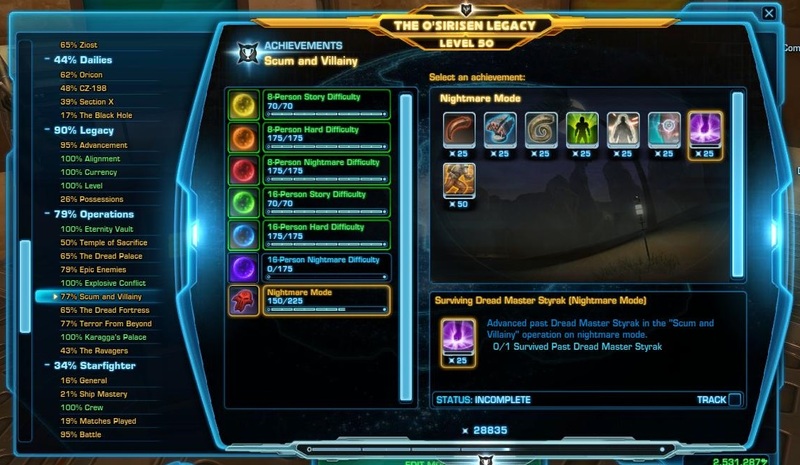 I remember looking into his quest log once and was horrified to find that he hadn't done his class story past Nar Shaddaa! I'm planning on having 1 character from each faction ready for KOTFE. I'm just happy that they're keeping the old content around for people to play with. IMHO, that was Cata's biggest failure.